The assignment of DNA from organic material to species or taxonomic groups is integral to a number of scientific disciplines. Metagenomics is an approach particularly suitable for viruses and bacterial species, which have a relatively small genome. The approach can be used to characterize environments according to their genetic fingerprint. Even without taking genomic approaches, however, DNA sequencing of selected markers from environmental samples may provide ecological information or identify relevant species such as human pathogens. A related field where unknown specimens are identified based on Cytochrome Oxidase I (COI) has become known as DNA Barcoding. SAP is a tool answer the central question in these fields: what taxonomic group does an unknown organism represented by a DNA sequence belong to? 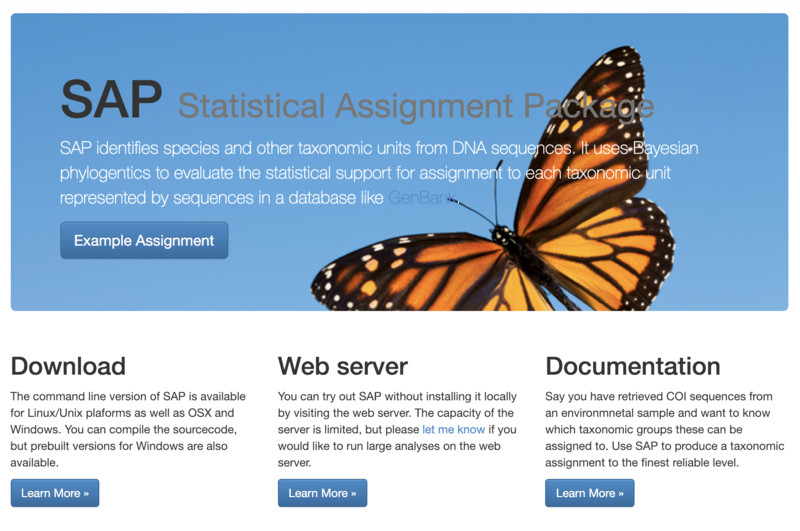 SAP uses a Bayesian approach to calculate a probability distribution over all taxa represented in a sequence database. The probability of assignment to each taxa serves as a measure of confidence in the assignment. SAP is available as both command line too and web service at [http://services.birc.au.dk/sap].